Patrick Rothfuss' The Name of the Wind has been called the best next read for fans of Game of Thrones*; a Harry Potter for grown-ups; this generation's Lord of the Rings; and the default go-to when an avid fantasy reader finishes (or rather, runs out of) Wheel of Time books to read. I get it. We can't read modern fantasy novels without comparing them to the lates and greats of our childhood (or adult) reading. Tolkien owns the world of sorcery. Harry Potter owns the world of magical universities. But why must every new(-ish) fantasy novel be the "new" this or the "new" that? Why can't these novels stand on their own, amidst their predecessors, their betters, and their lessers, as novels of other genres do? Am I just imagining that this affliction strikes at my precious fantasy novels more viciously than in other genres? Ultimately, though, I believe calling The Name of the Wind "the next Lord of the Rings" or "Harry Potter for grown-ups" only serves to set the book up for failure, because it is neither of those things. It is its own novel, an excellent addition to the fantasy genre, and a downright good book. Plus, it's full of tavern brawls and bawdy songs and clever schemes and awesome legendary evildoers. So there. The Name of the Wind is the first book of The Kingkiller Chronicle, a trilogy in which the legendary Kvothe the Bloodless recalls his story for a traveling scribe. The book is long, coming in at 650+ pages, and the story takes enough twists and turns that it would only do it a disservice to try to capture the plot for you. Suffice it to say that Kvothe, orphaned son of two traveling troupe-members, finds himself alone in a world that he no longer understands, a world in which he owns nothing more than the clothes on his back and the knowledge that the stuff of childhood tales is walking the streets. The lonely young boy struggles with poverty, homelessness, hunger, but a thirst for knowledge keeps him moving forward. In his journey to understand where mythology ends and history begins, Kvothe churns up secrets long left dormant, making a few fast friends and a more than a few staunch enemies along the way. He also turns himself into a legend. No big deal for a teenager. Rothfuss was smart to construct this novel as he has, with Kvothe narrating his own tale. The structure allows for present-day interludes within the narration of the past, and in these, Rothfuss reveals crucial details well before their occurrence in the storyline. The heightened drama only adds to Kvothe's re-telling, as the novel is as much a discovery of a new story as it is a means of filling in the blanks, understanding how the Kvothe of the story becomes the Kvothe of the storytelling. 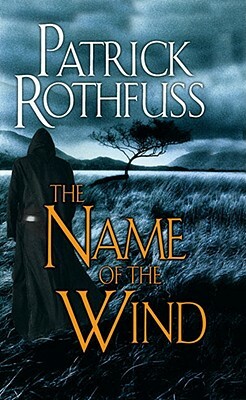 Both Rothfuss and Kvothe show a profound love of stories and storytelling, in its many forms, and The Name of the Wind is the first of three novels that raise storytelling to a new height, with expertly crafted characters and the comprehensive world-building that is crucial to successful fantasy. While I won't sit here and compare the book to any other work of fantasy, I will say this: if you enjoy a good story and a solid adventure and a little myth and and a lot of magic, you'll enjoy this. But if you try to tell me Kvothe is the "new Harry Potter", expect to have a book thrown at your head. The sequel to Name of the Wind is now out in hardcover and e-book: The Wise Man's Fear. One of the things I absolutely hate in publishing is the tendency to slap "THE NEW BLAHBLAH!" on the cover of a book. It's the publisher's method of "recommending" books, except that the "recommendations" come in comparison to the biggest hits, which obviously is an unfairly high standard. Exactly! And not just a high standard, but an incorrect one. Anyone reading Name of the Wind expecting a Harry Potter-like book will be grossly disappointed. My son just finished it and raved about it - he is now bugging me to put it on my list saying that it is one of the best "world building" books he has read in a long time.